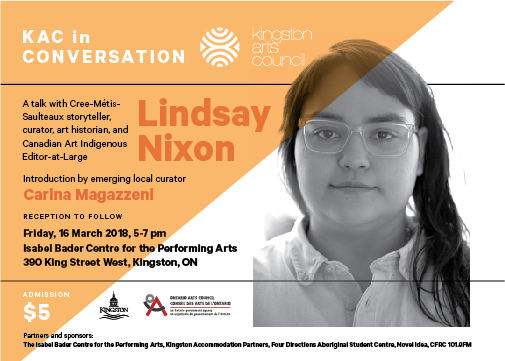 KAC in Conversation is a creative project by the Kingston Arts Council that aims to bring the arts and culture community together to learn new ideas, challenge the way we think, and provide a platform for diverse voices to be heard. Created in 2015 as a once-a-year event, the project has evolved into a regular series of talks that feature speakers from outside of our city in order to expand our knowledge and learn about our neighbouring communities through an arts lens. Each event is focused on a theme and also features a local artist who will be in conversation with the speaker. The events are followed by a social gathering, providing an opportunity to have a chat with your peers, community partners, fellow artists, and arts patrons, and celebrate our strong and active arts scene. Carina Magazzeni is an emerging curator, cultural worker, and digital designer; a femme settler from the Niagara Region, on Haudenosaunee and Chippewa territory. Currently living in Katarokwi/Kingston, Magazzeni maintains an active independent curatorial practice while also working as a Curatorial Assistant at the Agnes Etherington Art Centre. Recent independent curatorial projects include Many Voices: Indigenous Art, co-curated with Tania Willard; PARK LIFE: Interventions in Public Space as part of LandMarks2017/Repères2017; Cheryl L’Hirondelle: STANDING UP, SITTING IN, SOUNDING OUT, co-curated with Ellyn Walker; and Brad Isaacs: The Map of the Empire. In 2017, Magazzeni was awarded the Queen’s University Marty Memorial Scholarship to complete curatorial research for “Alternative Archives: Kingston’s Carceral Histories and Contemporary Realities.” She holds an MA in Cultural Studies from Queen’s University and a BA Honours in History of Art and Visual Culture with a Concentration in Curatorial Studies from Brock University. Thank you to our event sponsors: Isabel Bader Centre for the Performing Arts, Four Directions Aboriginal Student Centre, Novel Idea, Kingston Accommodation Partners and CFRC 101.9 FM. 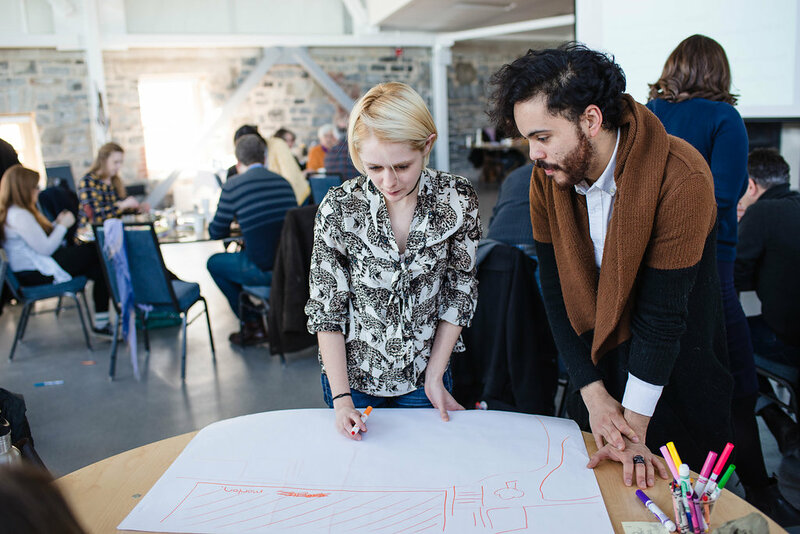 Collaborative, artistic and social-innovative answers are increasingly needed to address many of our cities’ issues, whether it is searching for creative approaches to community engagement or developing new designs for underutilized spaces. On Saturday 4 March we welcomed Sarah Udow and Jennie Suddick of Crazy Dames for a creative, fun and interactive workshop in the form of an artist studio, to explore how artists and other community members can contribute to improving city spaces in creative ways. Thank you to our partners and sponsors: City of Kingston, Sustainable Kingston, Tett Centre, Kingston Accommodation Partners, Keystone Properties. In its second year, the program explored the theme of Creative Placemaking. You can watch the video of the first event in this program below. You can read a quick recap of it here. 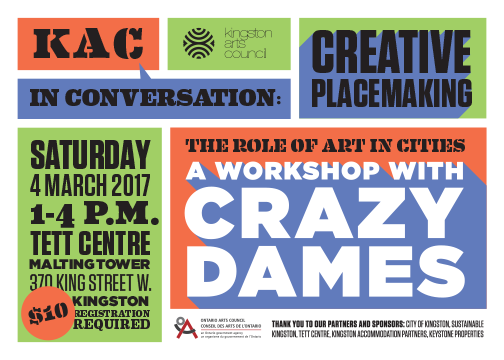 The second event featured Toronto creative duo Crazy Dames that led a workshop on the role of art in sustainable cities. We had the pleasure of talking to two community members about creative placemaking: Tracey Guptill and Sunita Gupta. KAC in Conversation: Creative Placemaking was supported by the Ontario Arts Council Grant. Sponsors: Kingston Accommodation Partners, Kingston Economic Development Corporation. 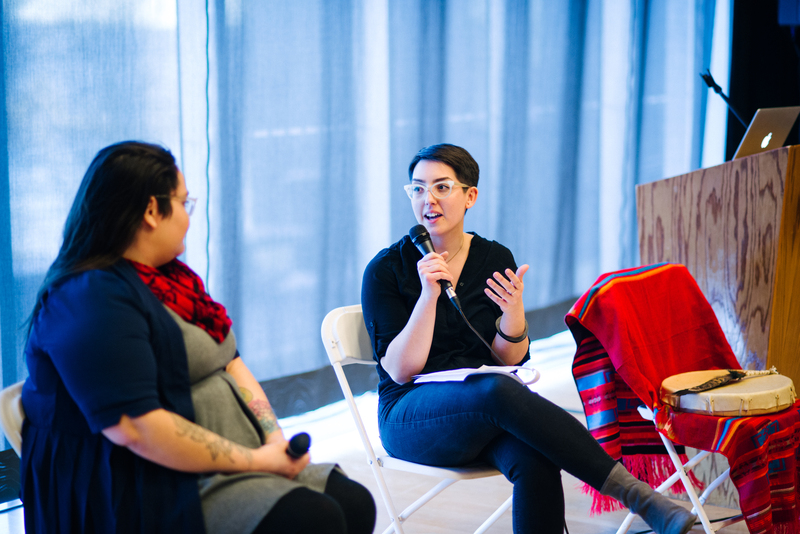 The first KAC in Conversation event explored the theme of activators: local artists and community organizers gathered to share insight into their practice. You can read a recap of the event here.